If large projects and configurations are used, the memory utilized by the IDE can fill up the maximum space allocated for the heap. To monitor memory usage, the memory tool bar can be used as shown here. 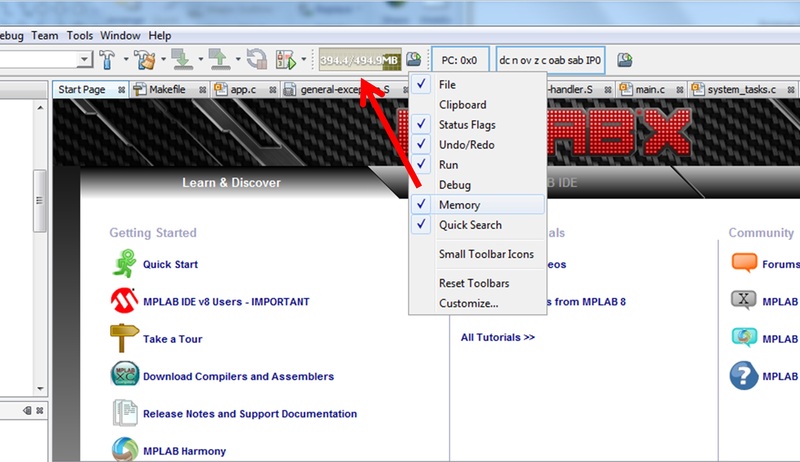 Right-click on any tool bar area and Memory is shown in the extended menu. By checking it so it is on, the amount of memory used over the total memory available is shown as a bar. The default memory size is 512 MB. If the numbers on the left hand side gets closer to the number on the right, it indicates that the the IDE is slowing down. During debug, real-time RAM and Flash usage can be displayed in the Dashboard Window. 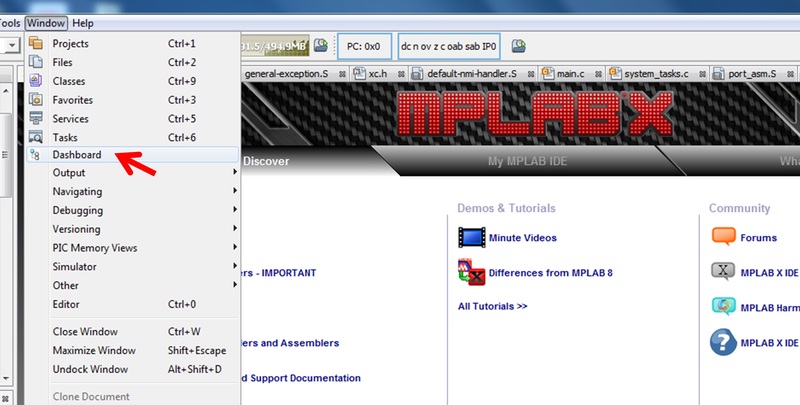 To launch the Dashboard Window, select Window ▶ Dashboard from the main menu. In the Dashboard Window, under Memory, two types of memory are shown. 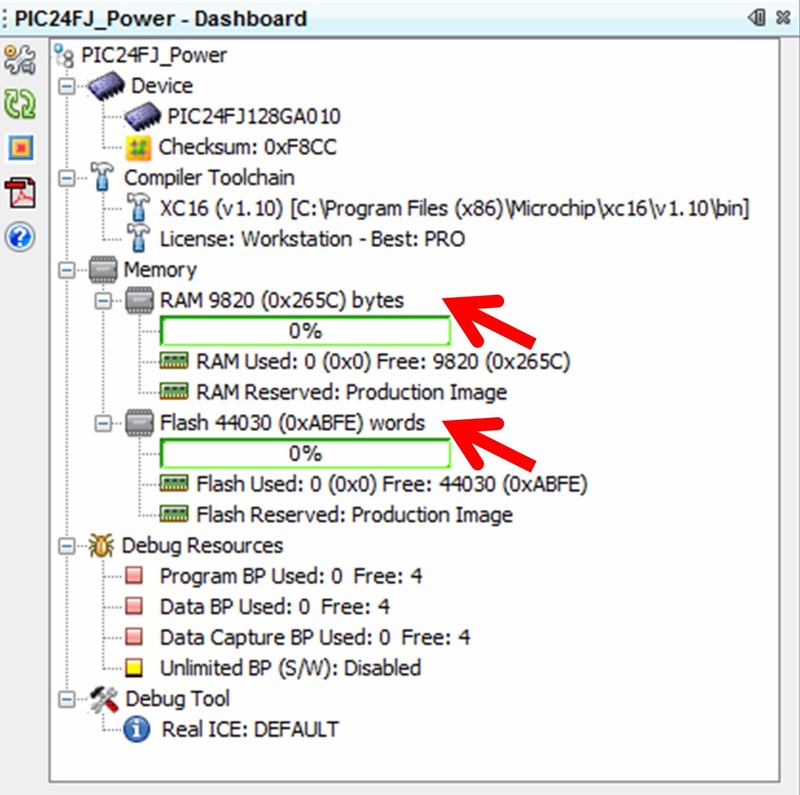 RAM (data) and Flash (Program). The amount of memory used by the project as well as memory reserved for debugging are shown in the percentage bar. Memory Used should be a guide to the amount of memory remaining. The compiler outputs a Memory Summary that details usage for Program Space, Configuration Bits, ID location, and EEPROM (if available on the device). The sum of these memory spaces, allowing for word sizes, should agree with the Dashboard's indication of Flash Used. The Map file should be examined when memory is at a premium.